Male Boeckella gracilipes, from here. The Centropagidae are a group of pelagic copepods found in both fresh and salt water. Characters (from J. M. Bradford-Grieve): Female with rostrum with 2 filaments; rostral margin not extended. Cephalosome and pedigerous somite 1 separate; pedigerous somites 4 and 5 separate. Posterior corners of prosome in lateral view bluntly rounded, or with 1 acute point, or divided into 2 protrusions; dorsal view symmetrical, or asymmetrical. Urosome with 3 free somites, or with 4 free somites. Genital double-somite asymmetrical in dorsal view; gonopores close together and totally covered by single genital operculum; without seminal receptacles. Caudal rami symmetrical. Antenna 1 with 24-25 free segments; ancestral segments X and XI partly fused. Antenna 2 exopod with 6-7 free segments; 10-11 setae; basis and endopod separate. Mandible basis with 4 setae; endopod terminal segment with 7-9 setae. Maxilla 1 basal exite seta present; exopod extends short of endopod distal border. Maxilla 2 coxal epipodite seta absent; endopod setae normal, or claw-like. Maxilliped coxal endite 2 with 3 setae. Leg 1 basis inner distal seta inserted directly on surface of joint; outer seta absent; endopod with 3 segments; exopod with 3 segments; exopod segment 1 with outer distal spine, or without outer distal spine; exopod segment 3 with 4 inner setae. Leg 2 endopod with 3 segments; exopod with 3 segments; exopod segment 3 with 2 outer spines, or with 3 outer spines. Leg 3 basis outer distal spine absent; endopod segment 3 with 5-8 setae. Legs 3 and 4 endopod with 3 segments; exopod with 3 segments; exopod segment 3 with 2 outer spines, or 3 outer spines; exopod segment 3 with 5 inner setae. Leg 4 endopod segment 3 with 4-7 setae. Legs 2-4 surfaces naked; terminal spine with outer border serrated. Leg 5 present; similar to legs 2-4; coxa inner border without seta; exopod segment 2 inner distal border extended into large spine completely fused to segment. Leg 5 exopod segment 3 outer border with 2 spines; inner border with 2 setae, or 4 setae. Male with urosome symmetrical in dorsal view, or asymmetrical in dorsal view. Mouthparts well-developed. Antenna 1 geniculate on right. Maxilliped endopod segments 5 and 6 with outer setae normal. Right leg 5 uniramous, or biramous; endopod 2-segmented, or 3-segmented; exopod 1-3-segmented, may be similar to other legs or may be highly modified into grasping organ. Left leg 5 uniramous, or biramous; endopod 2-segmented, or 3-segmented; exopod 2-3-segmented, may be similar to other legs or may be highly modified. [F44] Fairbridge, W. S. 1944. Marine copepods from Western Australia. Series II. Two pelagic copepods from Cockburn Sound. Journal of the Royal Society of Western Australia 28: 209–217. [F45] Fairbridge, W. S. 1945. West Australian fresh-water calanoids (Copepoda). I.–Three new species of Boeckella, with an account of the developmental stages of B. opaqua n. sp. and a key to the genus. Journal of the Royal Society of Western Australia 29: 25–65. [K-M02] Klein-MacPhee, G. 2002. Temperate basses. Family Moronidae. In: Collette, B. B., & G. Klein-MacPhee (eds) Bigelow and Schroeder’s Fishes of the Gulf of Maine 3rd ed. pp. 374–389. Smithsonian Institute Press: Washington. [N44] Nicholls, A. G. 1944. 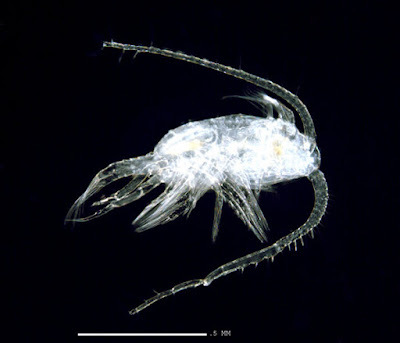 Littoral Copepoda from South Australia. (II) Calanoida, Cyclopoida, Notodelphyoida, Monstrilloida and Caligoida. Records of the South Australian Museum 8 (1): 1–62. [ZS10] Zhang, G.-T., S. Sun, Z.-L. Xu & Q.-L. Zhang. 2010. Unexpected dominance of the subtropical copepod Temora turbinata in the temperate Changjiang River estuary and its possible causes. In: China-Russia Bilateral Symposium: Proceedings of the China-Russia Bilateral Symposium of "Comparison on Marine Biodiversity in the Northwest Pacific Ocean", 10–11 October 2010, Qingdao (China) pp. 100–102. Institute of Oceanology, Chinese Academy of Sciences; A. V. Zhirmunsky Institute of Marine Biology, Far East Branch of the Russian Academy of Sciences.